LLHP 3rd Annual Mardi Gras Party Bus turnaround Trip. Its that time again!! Time us to take over New Orleans for Mardi Gras. As always we will have music, jello shots, movies, games, snacks, giveaways and more. There is no place like Mardi Gras in New Orleans the music, the parades, the food and of course the parties. 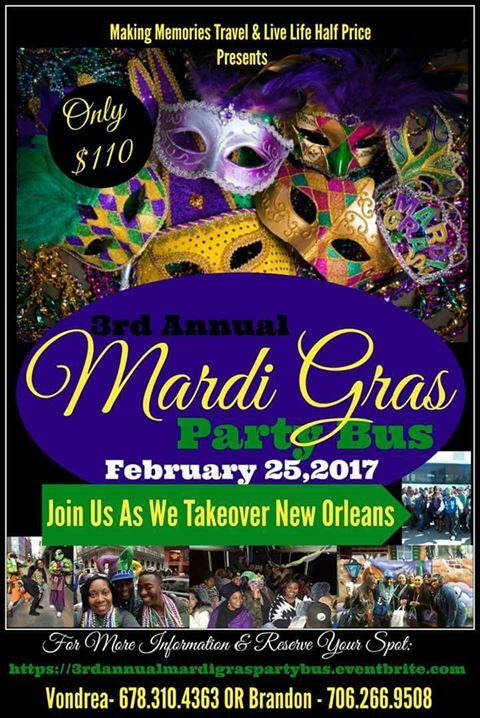 Experience a day of Mardi Gras with our turnaround Trip for only a $110 which includes roundtrip Transportation. For $40 get the hospitality suite where you can take a break from the party and recharge your phone. Seats are limited so get your ticket today!!!!!!!!!!!!! Could I be put on your email list for your deals?